More tried and true gear ready for your next bowhunting excursion. Yes, I’m still on cloud nine after my unforgettable Alberta bear adventure, but more on that later. For now, I want to continue on with Part 2 of my Canadian gear list. I want to reiterate the fact that every piece of gear – from your bow to your boots – should be tested thoroughly before heading afield. I tested each piece of my gear for months before stepping in the Alberta bear woods for the first time. I always take a pair of bows – whether I’m traveling only a few hours to a neighboring state or flying to another country – just in case something goes awry with one rig. 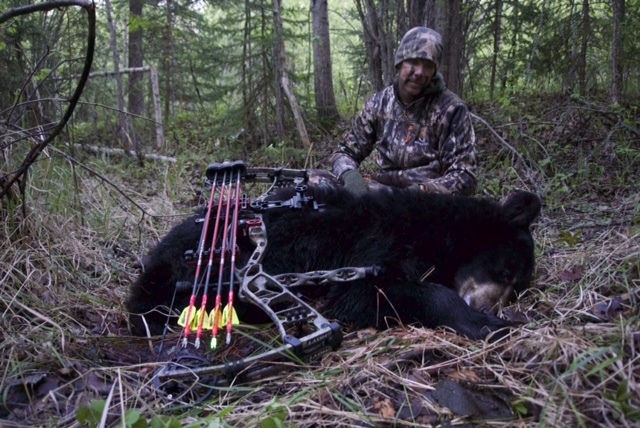 After harvesting my first bear, I pulled a switch to my Hoyt (www.hoyt.com) Nitrum 34. I’ve been shooting the longer axle-to-axle Nitrum all spring, and every time I handle the bow my confidence swells. Set at 68 pounds (it came from the factory at 71 pounds) my Nitrum 34 draws like butter, and transition to letoff is silky smooth. The generous 6 ¾-inch brace height coupled with the bow’s long (34-inch) axle-to-axle design makes it a tack driver. In addition, I really appreciate Hoyt’s dedication to eliminating torque. New for 2015 and easily noticeable to those who fire lots of arrows is the Zero-Torque Cable Guard System. This patent-pending system boasts a flexible arm that reduces the torque from the cables that are pulled to the side for arrow clearance; most importantly, the arm is reverse mounted to direct the cable-induced torque in the opposite direction of a traditional cable guard system. I will say without hesitation that the Nitrum 34 is, in my humble opinion, Hoyt’s most accurate, best-shooting bow to date. Personally, I shoot a single-pin sight better than a multi-pin sight. I enjoy the clutter-free housing and the single vertical aiming point. Plus, for this hunt, I knew the bears were going to be close. My plan was to lock my Black Gold (www.blackgoldsights.com) Ascent Ambush single-pin on my 20-yard mark and leave it there. Mission accomplished! I shot my first bear at 3 yards (no, I’m not exaggerating) and my second at 8 yards. The sight itself is very durable, and I appreciated the PhotoChromatic shell. I knew going into this hunt that last-light shots were likely, and I wanted my pin to be glowing. In addition, the sight works great with a one-piece quiver, and its new splined vertical drive increases overall durability by as much as 80 percent. For my broadhead arrow combo, I fired both Carbon Express (www.carbonexpressarrows.com) Maxima REDs (out of my Hoyt) and Victory (www.victoryarchery.com) VAP V1s (out of my New Breed) tipped with Rage (www.ragebroadheads.com) Hypodermics. The Hypodermic flies like a field point and cuts an enormous hole. I’ve also been very impressed with the head’s durability – the ferrule is one-piece steel – and the hybrid tip and .035-inch stainless-steel blades are razor sharp. The innovative Shock Collar promises in-flight blade retention, and it certainly delivers on that promise. I shot Hypodermics (actual heads, not just the practice heads) for months prior to this hunt, and I never had in-flight blade failure. During my testing I found Carbon Express Maxima RED arrows tuned perfectly out of my Hoyt Nitrum 34. My REDs tipped the scales at exactly 421.0 grains (with Hypodermic and Nocturnal lighted nock) and measured 28 ¼ inches (without broadhead). I found the REDs to be ultra-durable and spot-on accurate. My VAP V1 arrows also measured 28 ¼ inches (without broadhead) and tipped the scales at 398.2 grains (with Hypodermic and Lumenok lighted nock). I really appreciate the VAP’s micro-diameter (awesome for cutting through western winds) and Penetrator Hunting System outsert, which works in concert with the arrow’s ICE coating to boost penetration. Nope, were not done yet. I thought I could squeeze all of my noteworthy gear into a two-part section, but as the old saying goes, “Good things come in threes.” Stay tuned for Part Three.